‘Roping Rob’ Review – Journey FROM the Center of the Earth! We originally planned to describe Roping Rob [99c] as a “hook-throwing platform game", because modern gamers are familiar with that genre, thanks to popular titles like Super Quick Hook [$2.99 / Review]. However, according to the game description from developers, Wehaveapp, you’re actually carrying a harpoon, so let’s call it a “harpooning-platform game", which is technically accurate, but not quite as catchy. The game opens with a background story, which does a great job of setting the context for the game-play. The ‘Robs’ are little creatures who work at the center of the Earth, where they ensure the core is constantly stable, hot and fluid. However, one of the Robs is defiant and wants to travel, to check out the Earth’s surface. This game follows his journey through the Earth, with levels starting at the inner core and moving through the molten outer core, the lower and upper mantle and eventually to the crust, as he ventures to the Earth’s surface. I’ve always enjoyed games which take you on a journey, like the classic Gyruss (1983) where you progress through the planets in our solar system. Roping Rob uses this approach well, with each chapter being graphically depicted as a different environment, based on the Earth’s layered geological structure. As you play, you’re always very aware of your proximity to the surface, which encourages you to keep playing. There’s over thirty levels to complete, which is accomplished by locating and entering the glowing exit in each one. As always, there’s a range of obstacles along the way, including rotating platforms, spring-boards, barriers and buttons. You’ll need to harpoon through small gaps and even use a massive drill to dig through the Earth. 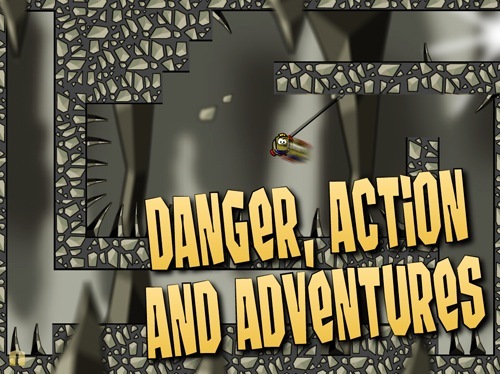 You’ll have to dodge spikes, rolling boulders and poisonous fumes, to be successful in this platform game. The gameplay controls are minimalistic, with no buttons or virtual pad. You simply tap the screen to throw your harpoon in that direction, and tap again to release it. Once your harpoon is impaled in a roof or wall, it automatically retracts, pulling you towards it. You can either let yourself be pulled right up to the harpoon, or else let go to throw yourself in that direction while you have momentum. There’s no left or right walking, just harpooning. This game is made using GameSalad, which often leads to a couple of knee-jerk negative comments, but it’s best to judge a game based on it’s own merits, regardless of which tools are used to develop it. Who cares how a game is made, providing it’s challenging and fun. And this game is both of those things. Although, there are a couple of minor gripes. Some loading delays occur at the start of levels, the screen sometimes changes orientation unexpectedly, or won’t change orientation at all, and the sound effects can become annoying, such as the constant metallic *clang* of the harpoon. And Level 16 is actually impossible to complete, but the developers already have a fix for this, which was just released in an update, so the Rob CAN reach the surface! High scores are stored (in-game) for each level, including time, number of harpoons used and number of tries. However, the number of tries is showing as “1" for each level, despite attempting one nasty level many, many times. Also, there’s a space for the total stats to be displayed, but that area is blank, presumably mistakenly. These issues have also been ironed out in the just-released update. Roping Rob is a simple game, with basic yet strangely appealing graphics. There’s a fair amount of entertainment provided, with replay value if you choose to better your own level completion times. The big question is – what happens when the Rob finally reaches the surface?